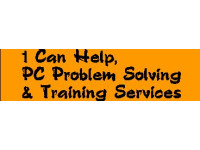 1 Can Help, PC Problem Solving & Training Services is a UK based consultancy specialising in PC Problem Solving & Training and providing impartial system purchase or upgrade advice. Dealing with both Corporate and Domestic Clients. Providing training, (on an individual basis or for groups), in Windows 10, 8, 7 Mac and leading industry standard software packages. Problem solving and advisory services in PC system configuration, memory management, comms., internet implementation and simple web site design, printing problems, multimedia upgrades and client-server or peer to peer networks. Servicing Sussex, Kent, Surrey and Central/South London areas. Or nationwide at cost plus rates.